Save on biker rain jackets, rain pants and rain suits, all biker rain gear is on sale when you shop at Motorcycle Gear Superstore. 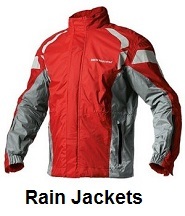 We offer the best selection of motorcycle rain jackets, rain pants and rain suits at the lowest prices possible. 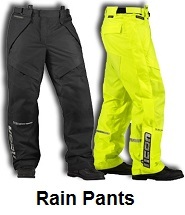 Shop and save on men's and women's rain gear at Motorcycle Gear Superstore. 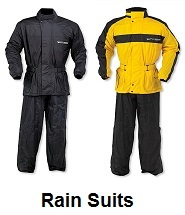 Shop for all the latest styles and fashions of motorcycle rain jackets, rain pants and rain suits. 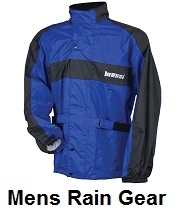 Shop the the largest selection of men's and women's motorcycle rain gear, rain jackets, rain pants, rain suits. You will find some of the best prices on all our protective motorcycle riding rain gear. 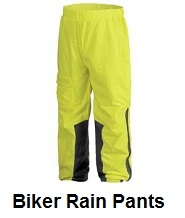 Shop for rain jackets, rain pants, rain suits for every type of motorcycle riding. You can find the best deals on all our motorcycle rain gear, apparel and clothes. 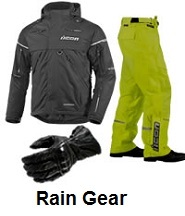 How to select motorcycle rain jackets, rain pants, or rain suits. Things to consider when selecting rain gear for riding motorcycles. One thing you will want to do is buy rain jackets, rain pants or a rain suits that are water repellent. 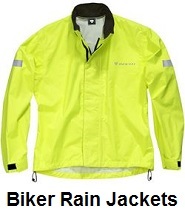 Some motorcycle rain jackets, rain pants or rain suits do not repel the water and will get your clothes wet. buying a cheap rain suit, rain jacket or pair of rain pants, will only lead to frustration later on. Why do bikers wear motorcycle rain suits instead of rain jackets or pants. Jackets or pants can have a tendency to leak water in, suits are made in one piece and have limited areas wear water can leak in. So suits are the number one choice to wear while riding in wet conditions. 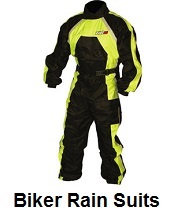 Shop for men's and women's motorcycle rain suits, motorcycle rain jackets and motorcycle rain pants, you will find competitive pricing on all suits. 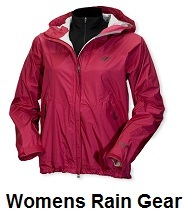 All our rain jackets, rain pants, rain suits, come with a 30 day unconditional return policy. Just return any rain gear, within 30 days and we will grant you a full refund.